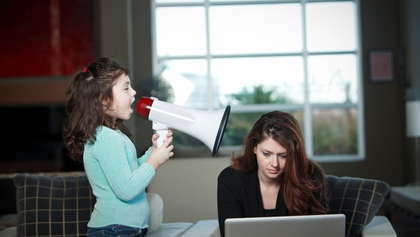 Learn skills and tactics to make working around your children easier. When you have children, being able to work from home sounds like the best thing in the world -- that is, until you actually try to do work. If you don’t set the tone early on, working from home will turn into a frustrating venture. I started working from home when my youngest child was born. She was a good baby and slept through the night and took a number of naps daily. When she was about 8 months old, that all changed. In fact, all I had to do was walk in the general direction of the computer and she would cry. Depending upon the ages of your children, it’s not likely that you’ll be able to work without interruptions for eight hours a day. You’re going to have to work around your children’s schedule, and that might mean working only during nap times, after bedtime, and early in the morning before they wake up. Most of the work you do online is going to have some sort of deadline or a particular schedule if telecommuting. Choose reasonable schedules and deadlines that work with your children’s lives. Give yourself a little padding on time for last minute issues such a sick child. Most infants sleep for the majority of the day, but it doesn’t always feel like it since they sleep in short spurts of time. Carve out working time around their sleep schedule for a longer and more productive workday. When your children get a little older and are more verbal they can understand the concept of special time and special toys. Buy some toys that you put into a basket that are only for use when you are working. That will make these toys special and give you extra quiet time for working. Big kids love feeling important. They can watch younger children, make beds, sweep floors, and sit at their own desk and do their own work while you do your work. Paying children a little money for their efforts can also teach them about budgeting and saving for the future. If you don’t take your work seriously, neither will your children. Explain to the whole family how important your work is to you, and that you will need a reasonable amount of alone time to be productive. Setting up a system of rewards works well too. Telling the children exactly what they will get for the right behavior can secure a whole afternoon free of distractions. Hire a teenager to help you after school and during the summer. Since you will still be in the house you can hire someone younger who costs less who can help entertain the children while you work. They can also help with some minor chores like picking up toys, helping clean up the kitchen, and bathing the kids. Working from home is a very doable and a worthwhile goal. You can earn anything from pocket money for movie night to a six figure income. It is absolutely necessary, however, to take your venture seriously and find a way to work around your children.